The Massage Business Mama, is intended to be a resource for ALL massage therapists. Whether you are a recent massage graduate, run a practice of one, or have a dedicated team of therapists working under you, you will find great take a ways on how to start and run your practice with more efficiency and ease. Consider The Massage Business Mama your ultimate guide. Here you will find a road map to help you get to your destination with fewer detours and more clarity. So buckle up and enjoy the ride. 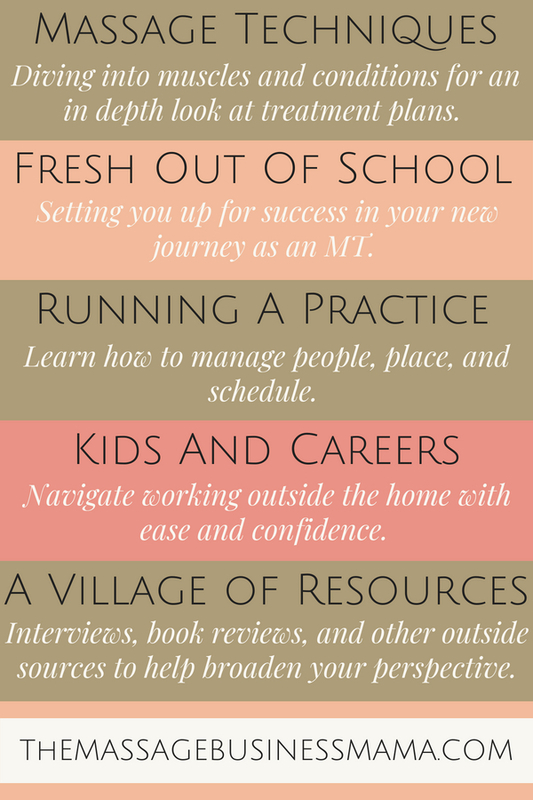 In this section, you will find helpful interview tips, hands-on skills, and practical business advice to guide you through your emerging journey as a new therapist. Here we will take an in-depth look at muscle groups, postural misalignments, and various health conditions. You will learn how to tackle these areas with confidence and skill. With 10 years of experience running and operating a successful massage therapy practice, I have learned a thing or two. Learn from my mistakes!